Attorneys have called the search of Botham Jean's apartment a "smear campaign." A legal expert calls it "good police work." Here's why it happened. DALLAS – Eight days after Botham Jean was shot to death in his own apartment by a Dallas police officer, lawyers for his family have called for the firing of the officer who shot him and blasted a search warrant that uncovered a small amount of marijuana in Jean’s apartment. Dallas Police Officer Amber Guyger, who turned herself in to the Kaufman County Jail Sunday, remains on administrative leave. 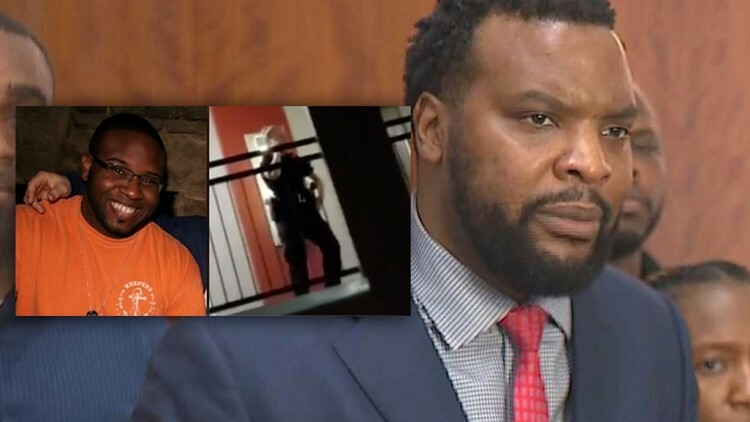 “Dallas police needs to send the message that there’s no place for a woman like that,” Jean family attorney Lee Merritt said in a Friday press conference. It has been the standard practice of the department to await indictment by a grand jury before firing police officers, although there have been situations in the past where an officer was fired prior to the grand jury’s decision. Merritt referenced “two suspicious shootings” in Guyger’s tenure as an officer. In May of 2017, Guyger fired her weapon at a drug offender who engaged in a physical altercation with police and took an officer’s Taser. Guyger was no-billed in that case, meaning she was cleared of all charges. Merritt and other Jean family lawyers have also criticized the search warrant that revealed about 10 grams – less than a half-ounce – of marijuana in Jean’s apartment. They claimed the release of that information was a “smear campaign” orchestrated by police to assassinate Jean’s character. The attorneys have questioned why police would have including searching for “narcotics” in the affidavit seeking to search Jean’s apartment. Legal experts say there are valid reasons investigators would have done so. Mulder and other legal experts say investigators would not want to risk evidence being thrown out because they did not include it in the search warrant. Legal experts pointed out that if police had not included narcotics in the search warrant and drugs had been found, for instance, in Guyger’s belongings left in Jean’s apartment, then that evidence would have been inadmissible in court. “You go ahead and put it in there just in case you find it,” Mulder said. He also says they may have included “narcotics” in the search warrant because someone may have already seen it out in the open in the apartment. App and mobile users, please tap here if you cannot see the image below. “I’m sure everybody saw it when they went in there to treat the man who had been shot,” Mulder said. “It’s in plain view. They’ve got to collect it." The attorney and Jean’s family also were upset that the news that marijuana was found became public on the same day that his funeral was being held. However, the timing could have been coincidental. Thursday marked the deadline for the search warrant return – the list of items taken from the apartment – to be taken back to court. WFAA obtained its copy of the return from the court. Among the items taken in the search were two bullet casings, a police backpack, Guyger’s ballistic vest and two used packages of medical aid. A search of a crime scene is standard procedure. In cases where a person cannot voluntarily give consent for a search, investigators routinely obtain search warrants. Otherwise, investigators would risk that the evidence that was obtained would later be thrown out by a judge. A consensual search was conducted on Guyger’s apartment in the hours after the shooting, according to information WFAA obtained from a source close to the investigation that was later confirmed by Merritt. It is unclear if police took anything during that search. The source said he was unsure if anything was taken because investigators did not provide an inventory. Still, Jean’s mother condemned the release of the information about drugs in her son’s apartment. Lawyers on Friday also accused Dallas police of “preferential treatment” toward Guyger and alleged officers were leaking information to the media. Search warrants, it should be noted, are court documents and thus are public record. Consensual searches are not public record because they aren’t accompanied by any corresponding court documents. According to an arrest warrant affidavit, which was written by Texas Rangers investigators, Guyger mistakenly went to Jean's apartment after parking on the wrong floor. She found Jean's apartment door "slightly ajar," the affidavit said, and inserted a key into the door, fully opening it. Guyger then saw a "large silhouette" across the room and thought it was a burglar, the arrest warrant affidavit said. She drew her firearm and yelled commands at Jean, according to the affidavit. Jean "ignored" the commands, so Guyger fired her gun twice, striking Jean, the affidavit said. Jean was taken to Baylor University Medical Center, where he died.